Bokken are wooden training swords used for blocking and paired practice kata. They are inexpensive and safer than iaito or shinken. We use them in the dojo for kenjutsu training where blocks/deflections are practiced. Bokken with plastic saya are available to allow an inexpensive alternative for training metal iato and wooden saya. We also carry a heavy versions of the bokken called a suburito. They are used for strength and endurance training. 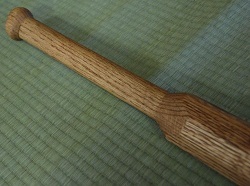 Recently, we have added another style of bokken; the tetsubou. This is similar to our suburito, but with the addition of metal rivets. It has the menacing feel of an oni, a japanese demon's club. Tetsubou can be found here.